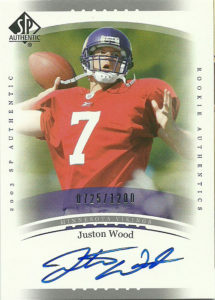 Juston Wood went undrafted after putting up some solid numbers at Portland State. In 2001, he put up 23 TDs to only 5 interceptions in 366 attempts for the PSU Vikings. Going undrafted, he signed with the Minnesota Vikings in 2003, but didn’t make the roster. Afterwards, Wood signed with the Arena Football League 2’s Central Valley Coyotes. He had a solid 2005 campaign with the squad, throwing for 89 TDs and 4,361 yards. He’d then have short stints on the New York Dragons and Philadelphia Soul over the next few years, retiring in 2009. As of 2016 he’s an assistant coach at Cal Poly State. Jy Bond deserves an assist for this one. The original plan was for me to attend the Colonials game against the Mountain Lions in early October, but with the NFL Lockout ending, the league scuttling the operations in Hartford, and rearranging their schedule, this was obviously out of the question. Among one of the cards I was most proud of was this high resolution shot* of Markee White making an understated tall grab. I knew this one would be awesome to get an autograph on. After hooking Jy up with his player card design, I moved forward with sending him a set of physical trading cards based off of the design early in August. During the exchange he also offered to hook me up with other members of the squad he knew. 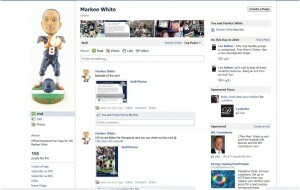 I immediately asked for Markee and he hooked me up with him via Facebook. I was surprised to realize that Kee played at Texas State- roughly 35 miles to the South of Austin, where I was from. Bobcat stadium also was the home of the San Antonio Riders during the early ’90s. We exchanged pleasantries and worked out virtually the same deal I had with Jy and went from there. It took him a while to respond, as he was hustling for a job, but in the end this one turned into a white elephant. Eventually irony interceded, and I happened to be at an Arena Football game in 2014 between the San Antonio Talons and Los Angeles Kiss, and it just so happened that he was on the Kiss. I attempted to flag him down after the game after I had made my way to the front of the visiting endzone, but he had already made his way through the crowd to the exit. He responded to my email on facebook, and again promised to mail me one out. I waited another year and a half and asked him again. Kee struck me as being a man of his word. That’s why it always bothered me I had never gotten a response from but, but lo after some 1700+ days, -the longest I’ve ever waited for an autograph, I got this sweet custom card signed. Markee finally got a gig after the UFL fiasco of 2010. 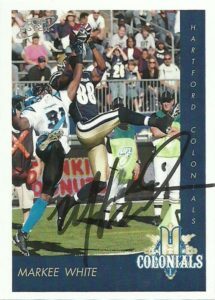 A member of the disbanded Hartford Colonials, – the UFL left him out to dry following the season. Kee rounded the wagons and headed to the CFL for a season, playing for the Calgary Stampeders in 2012. He returned to the AFL again in 2012 playing for the Arizona Rattlers, and then was traded in the offseason to the Jacksonville Sharks in 2013. Markee was again traded in 2014 to the Kiss, where he made a fearsome combo with Donovan Morgan at receiver. He was again traded, this time to the Philadelphia Soul, where he made an immediate impact catching an electrifying one handed grab against the Predators, in a must win game on ESPN. Markee finished the game with 5 catches for 64 yards and 3 TDs. Between the two teams White finished the 2014 season with 85 receptions for 855 yards and 13 TDs. 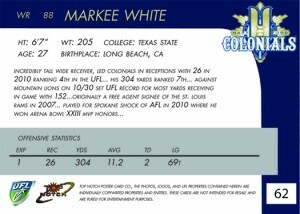 He returned to the Rattlers in 2015 and was having a career year with 16 TDs on just 57 receptions, but broke his back against the Spokane Shock. A metal rod had to be inserted, and although the doctors have said Kee can return to football after rehab, it is unclear as to when or if he will return. Disclaimer: The photos and logos remain the properties of their respective parties. The designs, bios, and presentations, I do claim ownership over. I am not affiliated with the United Football League or any of its member teams and these are classified as ‘mock up’ demonstration cards. Not for resale. *CREDIT: photo taken by Mike D’Avino from Sportspagemagazine.com. With time running out on the Talons franchise to find an owner and the last few weeks of the season on the horizon, I was still cranking out cards for the team even through their final hours. I kept going to the games and cheering on the team, but they finished winless at home with some games ending in heartbreak, while others the team just got completely blown out of. The Talons had been completely decimated by injury, and by being only given the green light to play only a month or two before the season, the talent pool had been drained. When promising prospect Colton Jones went down during the early part of the season, the Talons made a trade with the Iowa Barnstormers to grab Jeremy Schonbrunner. 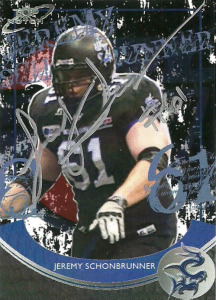 Since joining the AFL in 2012, Jeremy had spent time on the rosters of the Soul (2012), Talons (2013), and Barnstormers (2014). He’d also prove himself in the IFL with the Lehigh Valley Teelhawks gaining valuable experience and playing time. In college at Temple, Jeremy played in 38 contests along the line, and on special teams, with 9 starts coming at Center. As I was getting the autograph of Shane Boyd for the umpteenth time after the game, Jeremy commented on my cards and said, “If you make one of me, I’ll pay you for it!”, so I set out to make it happen. In person, with both legs in protective knee braces, Jeremy looks like a stout machine, but there were very few photos of him in action, so I really had to work hard to find something. Unfortunately I was not able to make the final game due to illness, so I contacted him directly and sent the cards to Jeremy via the mail. He signed this card and had it back to me in no time flat. After the Talons ‘suspended’ operations following the 2014 season, Jeremy was signed by the Tampa Bay Storm.